This is dish is one of my favourite midweek meals, mainly because it involves almost zero effort yet it feels a little bit fancy. I’ve made it in many various forms with different types of beans and different types of fish but this combination has to be my favourite. Any white fish will work, I tend to buy whatever’s cheapest or whatever is on offer that week. I’ve always thought reaching for the cod is a lazy option, if you like cod you’ll like all the other white fish and if you constantly have the same thing then you’ll never get to try anything new. Hake is a personal favourite as I find it a bit meatier than some of the other options. 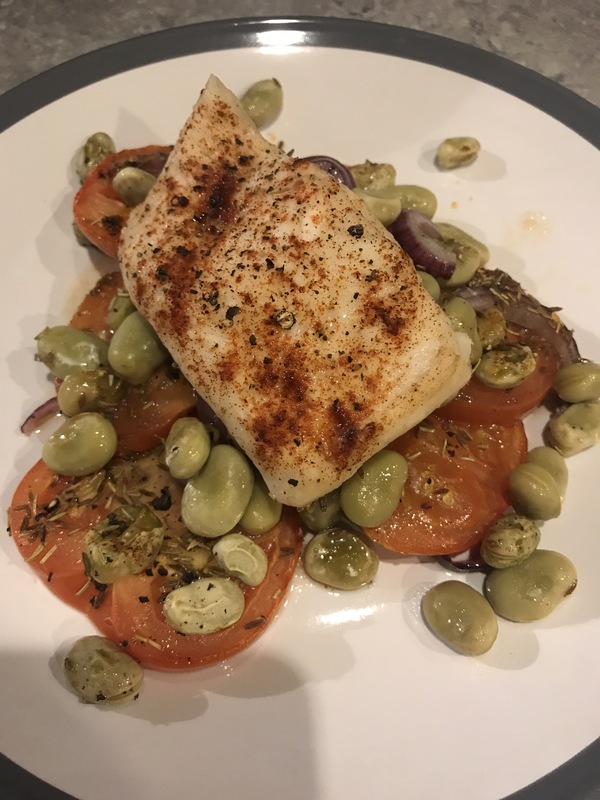 The best thing about this dish is that The Boyfriend, who tends to turn his nose up at anything that too closely resembles a salad, said ‘Ooo that was nice, you can make that again’ … bingo! 2. Cover a baking sheet with a sheet of grease proof paper. 3. Spread the tomatoes, red onion and broad pens on the tray and drizzle over the olive oil. 4. Sprinkle over the cumin seeds and dried rosemary and toss to ensure everything gets and even coating. Season generously with salt and pepper. 5. Place the fillets of fish on top of the vegetables and top with the paprika and a final pinch of salt and pepper. 6. Bake in the oven for 20 minutes. 7. Remove from the oven, share the vegetables between to plates and top with the fish.